I know, I know - not barely a week into the new year and I'm already writing about cookies. But I made these right after Thanksgiving and they are too good not to share with you now. My brother and nephews came up to spend Thanksgiving with me here in Chicago, since I was unable to make it down to Austin. They did not stay with me, however, as all four of them (three close to or over 6 feet tall) are just too much for my tiny apartment, especially the way it is set up now. So they stayed at a La Quinta downtown (I didn't even know there was a La Quinta in the city) and we got together during the day. Which meant I had mornings and evenings to myself, which kind of made it the perfect visit. Being young, they slept late, which meant I had quite a bit of time in the mornings. And when they went to the Museum of Science and Industry on Friday I had even more time. I had not cooked in a while and I was feeling the itch, so I decided to bake some cookies for them to take on the road back home with them. As far as I know, none of them are big fans of oatmeal cookies so I am not completely sure why I decided to make these Golden Oat Cookies. 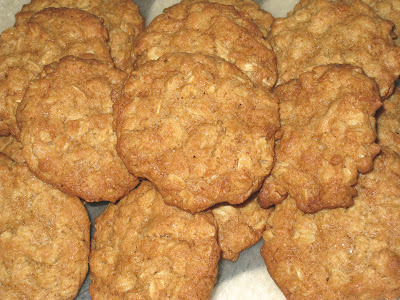 But they looked different enough from the usual oatmeal cookies (and, more importantly, did not contain raisins), and the recipe calls for golden syrup, my new favorite sweetener. So I decided to go for it. And they were worth it. Unlike the soft, chewy oatmeal cookies with which I am most familiar, these are still somewhat chewy, but like their name they are golden and crisp. I am still loving the International Cookie Cookbook, which is where I got the recipe. I have not found a dud yet. One of the things I like the best about these cookies is that they are not too sweet, and the oats lend a wonderful toasty sensation to the flavor. I am glad that I kept some behind for myself because they were quite a treat. Did the boys like them? All I know is that the cookies had disappeared before they got home. So when that first urge of the new year comes creeping up on you, give these a try. They will satisfy your sweet tooth without making you feel too guilty. Preheat the oven to 350 deg. F. Grease several baking sheets and set aside. Thoroughly stir together flour, baking powder and baking soda. Place in upper third of preheated oven and bake for 9 to12 minutes, or until cookies are golden brown all over and slightly darker around edges. Let stand for 2 to 3 minutes before transferring to wire racks to cool.